Boxes and Supplies: Coming Soon! 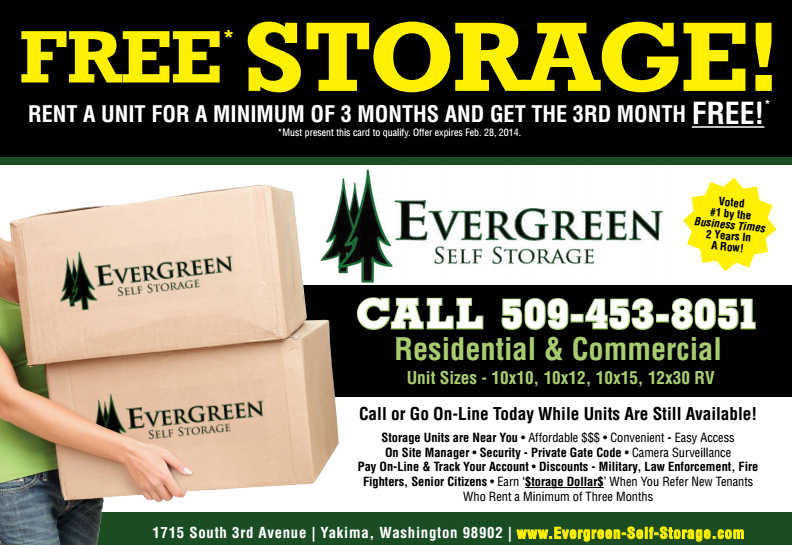 At Evergreen Self Storage in Yakima, Washington, we believe that you deserve the best when it comes to your storage space, which is why we offer state-of-the-art security and many amenities designed to fit your specific storage needs. We service both commercial and residential customers in the surrounding communities of Moxee, West Valley, Selah, Gleed, and Wapato. Your items and property are always protected when you use our services. Our storage facility is fully fenced with security lighting and equipped with round the clock video surveillance and personalized gate access codes. In addition, a manager is always onsite during normal business hours, monitoring the grounds and available to answer questions. Our indoor ground level units are accessible to nearly any vehicle by way of paved driveways, and you can even store large vehicles like RVs, cars, and boats with us. Our storage units have more cubic footage and are significantly taller than our leading competitor’s units. That extra space means that you’ll have more room for your items and less of a chance of damaging them. Call today to reserve your storage space!